Writing samples were collected from all students in grades 2-7 in September, January and May in the first year of school-wide use of EmPOWER. Samples were analyzed for length (number of words written) and overall writing quality (as measured by a 10-trait analytic rubric developed in partnership with school personnel). 95% inter-rater reliability for rubric scores was obtained by two raters. 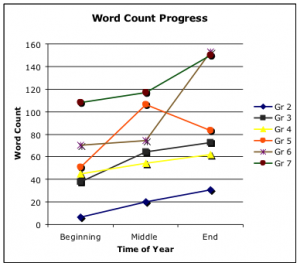 Statistically significant gains were seen in length between all three assessments (beginning, middle, and end of the year samples), revealing a marked increase in student writing output across all grades. The only exception to this trend was in fifth grade, where large gains were seen between September and January followed by a decrease between January and May. Qualitative analysis revealed that these students initially became quite verbose, but their writing was disjointed and tangential. In the final half of the year, they used fewer words but expressed themselves more concisely and effectively. Writing quality was captured by totaling the trait scores on the analytic rubric. 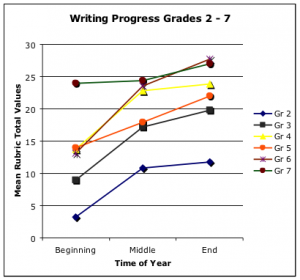 On average, significant gains were seen in overall writing quality at each grade level, with marked improvement from the beginning to the middle of the year and then steady improvement from the middle to the end of the year. Overall, marked gains were evident in the amount of written output as well as the quality of student writing in all grade levels. Changes in teacher self-efficacy for teaching writing were assessed via an anonymous survey. All teachers reported that EmPOWER increased their success with teaching expository writing to a “moderate” or “significant” degree, and all felt they were given adequate training. 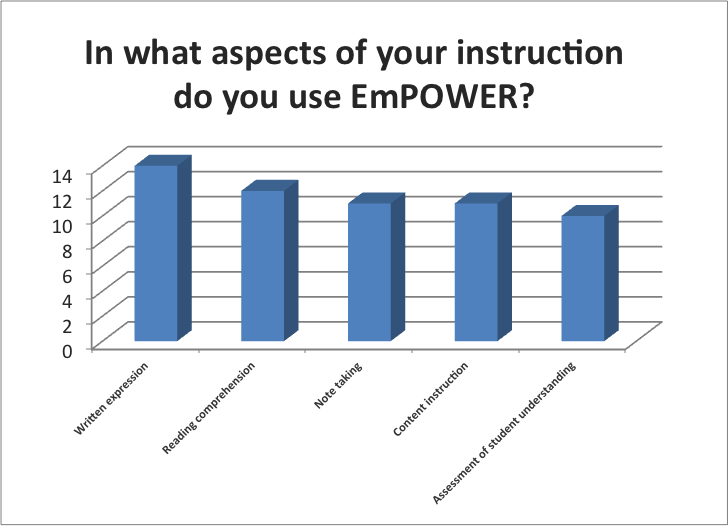 Also, faculty indicated that they used EmPOWER and its embedded strategies across the curriculum. “I’m committed to data-driven curriculum decisions, which is why we measured the impact of this professional development so carefully. I wanted to know what it was doing for my teachers and for our students. We did nothing different this year except adopt EmPOWER, and we saw gains in writing that we’ve never had before. As an administrator, when I see the same trend in outcomes across every teacher and grade level, I know we’re onto something that is having a real impact.” – Head of School, The Summit School. 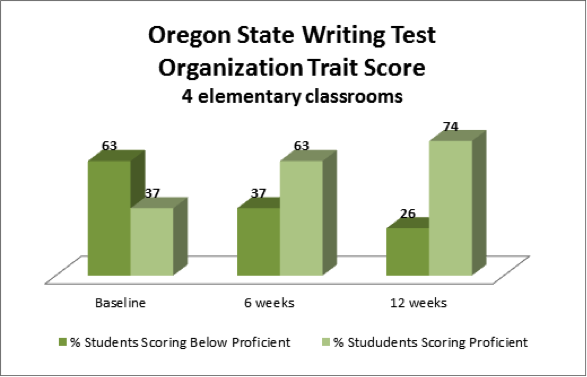 Independent student writing samples were obtained from students in four elementary school classrooms over two 6-week data cycles to assess progress in Organization, as assessed by the Oregon State Writing Test. The percentage of students scoring in the Proficient range on the trait of Organization rose from 37% to 74% in just 12 weeks. Student performance with expository writing was assessed using the Oregon state writing test assessment rubric within a fourth grade general education classroom. Over the course of 18 weeks, student performance improved significantly with respect to Ideas/Content, Organization, and Sentence Fluency scores. Gains in Organization were most pronounced for students receiving special education services. Students also showed marked improvement on a rubric measuring their ability to answer all facets of the assignment, use multiple planning strategies effectively, and use the EmPOWER steps and strategies independently. How does implementing a systematic writing strategy (EmPOWER) impact students' expository writing in fourth grade? To determine how EmPOWER affects students of differing ability levels in a general education classroom, the work of three students who were performing above grade level, on grade level, and below grade level in writing was assessed. Student essays written prior to and after nine weeks of whole class instruction using EmPOWER showed marked gains in measures of text Length. (Number of sentences written doubled for the above grade level student and tripled for the students performing on and below grade level.) Further, rubric scores for Elaboration/Idea development, Organization and structure, Voice, and Richness of language also increased, while measures of Conventions showed no change. While gains in these areas were evident for all three students, they were more pronounced for the students performing above and on grade level. All three students spontaneously used the EmPOWER dialogue and graphic planning strategies to write their final text. Moreover, they were able to explain the purpose and strategies associated with each step of EmPOWER in structured interviews, demonstrating their understanding of and internalization of the EmPOWER approach to academic writing.